Stuart and his wife Adele with Dr Asem Ali. Stuart Dixon, 58, became the first patient to be “blue-lighted” from Scunthorpe’s Hyper Acute Stroke Unit to Hull Royal Infirmary to undergo a mechanical thrombectomy to reduce the risk of brain damage or long-term disability. Stuart said: “My care has been incredible. His wife Adele said: “I don’t know how we can say thank you. Everyone was in the right place at the right time when we needed them. Strokes are caused when a patient experiences a blocked artery, usually caused by a blood clot, and the blood supply to the brain is cut off. Around one-third of people are suitable for clot-busting drugs, which can be administered up to four and a half hours after the onset of a stroke. However, drug therapy may not be effective in patients with blockages in large arteries. Instead, those patients can now benefit from the new regional mechanical thrombectomy service at Hull Royal infirmary, effective up to six hours or even up to 24 hours after the onset of symptoms. Stuart had gone downstairs on November 12 to make himself and Adele, 51, a cuppa before returning to bed. He coughed, spilling tea from his mouth, and Adele knew instantly something was wrong. Stuart was rushed to Scunthorpe District General Hospital and within 30 minutes, had been scanned and given a clot-busting drug. 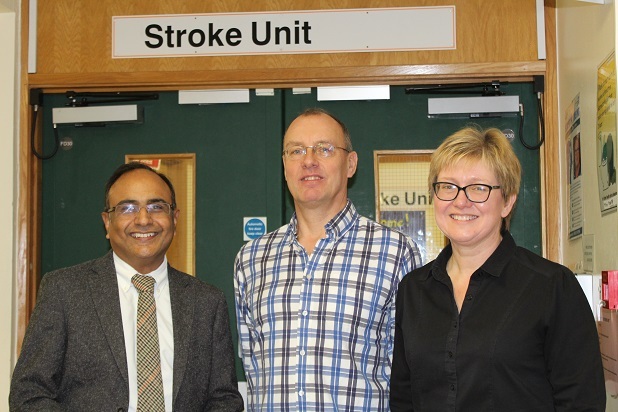 Dr Asem Ali, consultant in stroke medicine and the stroke team lead at Northern Lincolnshire and Goole NHS Foundation Trust (NLaG), realised Stuart would be a suitable candidate for the new mechanical thrombectomy service. blood clots, enabling some people to recover mobility, speech and other faculties damaged by an acute ischaemic stroke. The team at Hull discovered a tear in Stuart’s carotid artery was leaking. A clot had formed in the artery and a further two had broken off and moved into the brain, causing the stroke. These were all removed during the procedure. Stuart spent the night at Hull before returning to Scunthorpe where he spent three days undergoing intensive physiotherapy before being transferred to Grimsby Hospital to continue rehabilitation. He said: “I had to learn how to walk again. Using the walking frame was terrifying to begin with as I had no balance and even sitting in a chair was scary. “Every day I am making progress. I couldn’t tie my own shoe laces or use my fork properly. Dr Ali said: “Strokes can cause catastrophic damage leaving patients with life-long disabilities. However, if people act FAST there is so much more we can do these days and can limit the damage caused by stroke. Hull’s consultant radiologist Dr Paul Maliakal, who carried out the procedure, said: “The treatment isn’t suitable for all patients but it can make a huge difference to the people for whom mechanical thrombectomy is appropriate. Be the first to comment on "Engineer says new hospital stroke service saved him from brain damage"